The widest in the world aircraft that projected to be aired and tested in the 2016's. The aircraft named 'Stratolaunch' was built by the founder of Microsoft, Paul Allen, since 2011. As quoted from Engadget on Tuesday, August 4, 2015, the aircraft is currently under construction at the final stage in the Mojave Air and Space Port in California. The aircraft designed by the company Stratolaunch Systems is not intended to break the world record, but the main purpose is to launch a satellite rocket from the air.The satellite carrier rocket will be picked up by Stratolaunch up to a certain height before being released and slid alone into space. 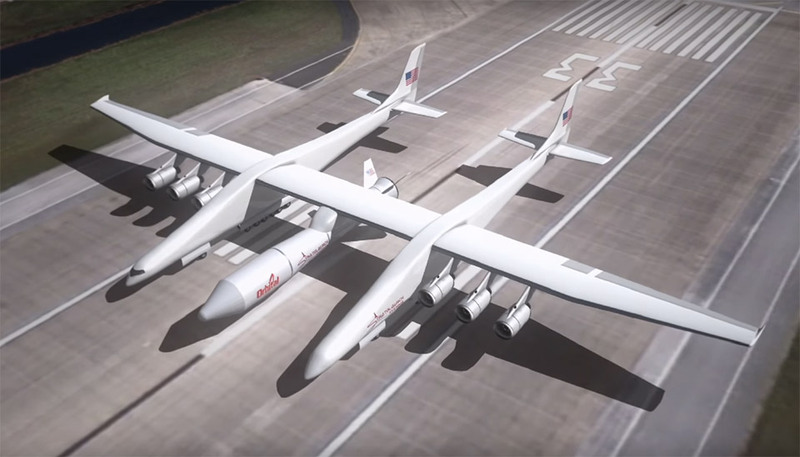 By launching a satellite carrier rocket in the air, Stratolaunch Systems claims to be savings and fuel, as rockets do not need to launched from the land. The same aircraft also can be used again for the next launch mission. In addition, the launch rocket also will not be hampered by the weather because the aircraft could launch a rocket from any location as desired. 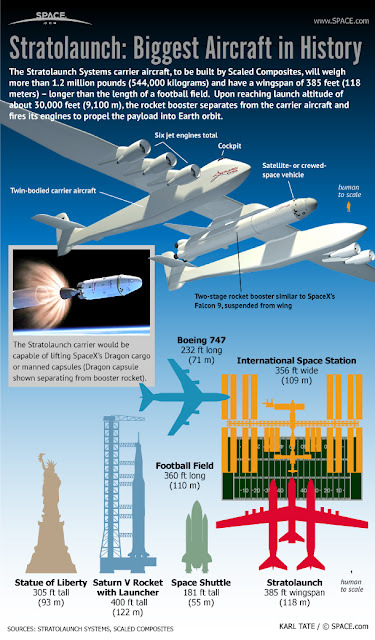 However, the weight of rockets and satellites that can be carried by Stratolaunch be limited, following the design of the maximum carrying capacity of the aircraft. The Staratolaunch design company, Scaled Composites which makes this plane by using the basic design of the two units of Boeing 747. 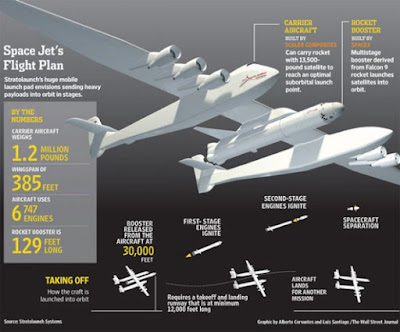 The shape and design of Stratolaunch resembles the design of Virgin Galactic plane belonging to a wealthy businessman Richard Bransonn, the two airframe (fuselage), which integrates with wings. The difference, if Virgin Galactic carrying space shuttle between its fuselage, then Stratolaunch carrying a satellite launcher rocket. The Stratolaunch's wingspan (distance between the two ends of the wings) will reach 385 feet, or the equivalent of 117 meters. The wing span of 37 meters will be wider than the wingspan of the Airbus A380, the largest commercial transport aircraft today. Because it was so great, then Stratolaunch require a runway longer than commercial aircraft in general to take off. If the aircraft along the runway generally require two to three kilometers for takeoff, then Stratolaunch along the runway took 3.5 to 4 kilometers.